PITTSBURGH — Zack Greinke pitched six scoreless innings, staying in through two rain delays, and the Arizona Diamondbacks beat the Pittsburgh Pirates 7-2 on Saturday for their third consecutive win. Paul Goldschmidt homered for NL West-leading Arizona, and David Peralta drove in two runs. Goldschmidt also walked twice and scored three times. Greinke (7-5) allowed two hits, struck out seven and walked none. He also doubled and scored on Jon Jay‘s double in the fourth. The Pirates hit just four balls out of the infield against Greinke. Goldschmidt walked and scored on Peralta’s triple in the first. Peralta then scored when Sean Rodriguez‘s relay throw landed in the Pirates’ dugout. The two delays combined to halt play for 1 hour, 21 minutes. Diamondbacks LHP Robbie Ray (strained right oblique) will make his third rehab start on Monday. Diamondbacks RHP Clay Buchholz (1-1, 2.94 ERA) is expected to start the series finale on Sunday. In three starts on the road, he has a 2.12 ERA and is holding opponents to a .180 batting average. 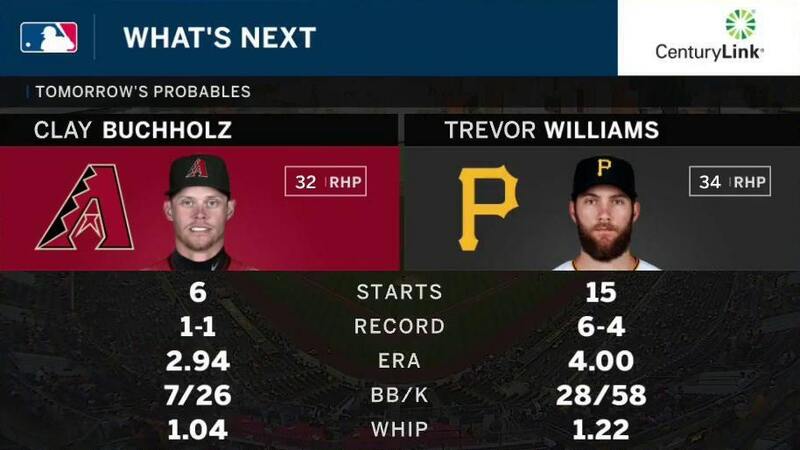 Pirates RHP Trevor Williams (6-4, 4.00 ERA) is coming off one of his best outings of the season, when he struck out seven over seven one-hit inning Monday against Milwaukee.